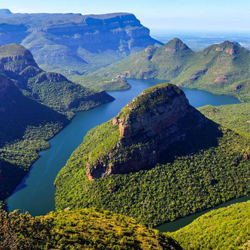 Mpumalanga means "east", or literally "the place where the sun rises" in the Swazi, Xhosa, Ndebele and Zulu languages. The province lies in eastern South Africa, bordering Swaziland and Mozambique and constitutes 6.5% of South Africa's land area. The capital of Mpumalanga is Mbombela, better known as Nelspruit. Our 5 day magical escape takes us through the eastern low-altitude subtropical Lowveld/Bushveld, with a predominantly savanna habitat. The Drakensberg exceeds heights of 2,000m in most places, with this central region of Mpumalanga being very mountainous. These regions have alpine grasslands and small pockets of Afromontane forest. The Lowveld is relatively flat with interspersed rocky outcrops. The Lebombo Mountains form a low range in the far east, on the border with Mozambique. Some of the oldest rocks on earth have been found in the Barberton area. These ancient greenstones and metamorphosed granites form the Crocodile River Mountains in the southeast of Mpumalanga. The Lowveld area is underlaid by African cratonic basement rocks of ages in excess of 2 billion years. Our 5 day tour explores the spectacular scenery and passes in this area and is specifically aimed at Western Cape riders, which do not often have the time to explore Mpumalanga on two-wheels. The tour price therefore includes transport of your motorcycle from Cape Town to Johannesburg and back, as well as return flight tickets from Cape Town to Johannesburg. For Johannesburg riders (or other areas), please contact us for a custom quotation to join us on this magical tour. Most of this trip will be on tar roads except for some shorter sections of dirt to allow us to see more of this scenic part of our country. Small groups of only approximately 8 motorcycles allow for a more personalised and unique experience. The trip is suitable for riders which are comfortable with mountain passes and sharp bends (intermediate riders) and is pillion friendly (because you would love to share this amazing experience with someone special). 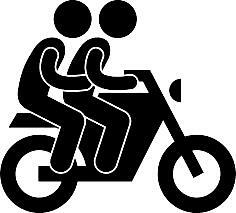 If required, we can arrange motorcycle rentals for you. This will incur additional costs. Please contact us for a quotation. Roads & Terrain: Expect beautiful scenery and mountain passes with lots of twisties. Any activities not included above e.g. Zipline, Big Swing, Flyfishing equipment rental etc. Fly from Cape Town to OR Tambo Airport in the morning. Upon your arrival the shuttle (Uber) will take you to our nearby depot, where your bike will be ready and waiting for your Magical Mpumalanga Quick Escape. 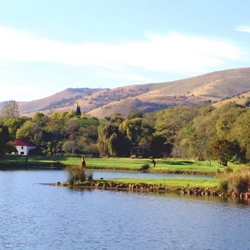 After changing into your riding gear and securing the luggage to your bike, we will be out of the city and on our way to Dullstroom, which is home to one of South Africa’s finest trout fishing rivers which attract eager anglers from across the world. The small town is also home to the highest altitude train station in South Africa. Try your hand at Fly Fishing in the late afternoon whilst relaxing and enjoying the surrounds, before a sumptious dinner at our overnight accommdation just outside town. After breakfast we are heading towards the forestry town of Sabie via the spectacular Longtom Pass. The Long Tom Pass is 2,138m above sea level and climbs 671 vertical metres with 66 bends. It is probably Mpumalanga's most popular pass. We visit the Lone Creek Waterfall just outside Sabie and also stop at the Mac-Mac Falls on our way to Pelgrims Rest. Our route takes us through the narrow Bonnet Pass with its 59 bends. 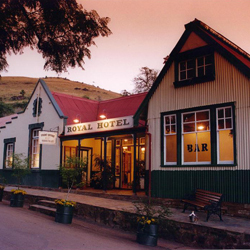 We stop at the Royal Hotel in Pelgrims Rest for a light lunch. From Pelgrims we proceed to Orighstad via Robbers Pass. Robbers Pass is 1,789m above sea level and has 68 bends just to keep us all humble and honest. Once through Orighstad, we head towards Hoedspruit via the scenic 24km long Abel Erasmus Pass, which has 62 bends of which 12 exceed an arc of 90 degrees. The Abel Erasmus pass has an altitude variance of 737m and includes the Hans Strydom tunnel which is 133m long. After the tunnel we head towards Hoedspruit where we will overnight. From Hoedspruit we head back up the Abel Erasmus Pass towards the Blyde River Canyon visiting the 3 Rondawels, Bourke's Luck Potholes and God's Window. For lunch, we stop at the famous Harrie's Pancake in Graskop for the obligatory pancake. Our route towards Hazyview takes us via Kowyns Pass which drops in altitude of almost 1,000m, from the plateau rand down into the Lowveld. From Hazyview we ride the most popular bike route in Mpumalanga - the 22km (more commony known as the 22) between the Kiepersol turnoff and Sabie over the Bergvliet Pass on the R536. To quench our thirst, we stop at the popular Woodsman Restaurant in Sabie. Our accommodation is a few kilometers out of town, where will end our day with breathtaking views over the escarpment. After breakfast, we ride towards Nelspruit via Hendriksdal on the R37. We approach Barberton, which has its origin in the 1880s gold rush in the region, from Nelspruit side over the Hilltop Pass. The Hilltop Pass decents 326 vertical metres and has several bends, of which 3 are in excess of 120 degrees. 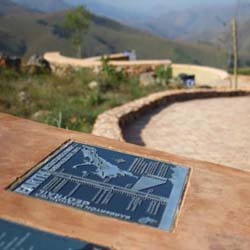 Once in Barberton we travel towards the Swaziland border via the Saddleback Pass, one of the steepest in the region. This pass is 10km long, with an altitude change of 609m and probably one of the most spectacular passes in Southern Africa over some of the oldest mountains on earth. After the Lomati Dam the pass, change name to Bulembu Pass. At the top of the mountain just before the Swaziland border, we decent to Badplaas known for its healing springs in the foothills of the Dhlumuhlumu mountains. 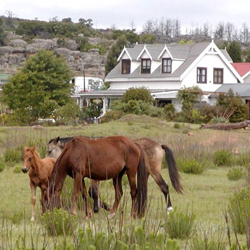 We proceed to Kaapschehoop (known for it's wild horses) for lunch via the Bothasnek Pass and Nelshoogte Pass. We overnight at Misty Mountain, on the Long Tom Pass, just outside Sabie. After a leisurely walk and breakfast in Kaapschehoop, we head back to JHB via Schoemanskloof. In Schoemanskloof we will stop at Old Joe just to say hello. After Schoemanskloof we get back onto the N4 heading back to Johannesburg to catch the plane back to Cape Town late afternoon.